Following our first night camping for the year, we made a quick breakfast and were on the road shortly thereafter. We had quite a bit that we intended to fit into the day and a lot of driving in between. The primary cause for this being counties. We’ve made a good show for ourselves in getting most of the Upstate New York counties, and prior to this trip one of the few regions we had yet to visit was the Eastern shore of Lake Ontario. We were making it a point this weekend to visit all four counties. We continued west on the Stillwater road, eventually returning to paved roads near Lowville, NY in Lewis County: check! We didn’t stop however, and instead continued due West on NY 177 heading over the Northern reaches of the Tug Hill Plateau. Tug Hill is an area that we only became aware of recently during our visit to Albany’s Museums. The most noteworthy thing about Tug Hill is that due to its relative elevation and proximity to Lake Ontario, it receives the largest amount of snow in the state, receiving upwards of 200 inches annually. Fortunately/Unfortunately it was Spring, and we didn’t have any opportunity to take advantage of the numerous snow sports available. As we descended from the plateau we entered into Jefferson County, took the interstate South a couple miles into Oswego County, and then headed to the lake. We made a brief stop at Selkirk Shores State Park, thinking it was the starting location of a series of boxes, before realizing that we really wanted Southwick Beach State Park a few miles up the road. Good thing these state parks are still free! Once we were on the right track we started a short hike through a wetlands (that reminded us greatly of South Carolina) eventually making it to sand dunes and a beach. Unfortunately, the beach was trashy and the boxes missing, so we didn’t stay long. We continued heading North from here following NY 3 towards Sackets Harbor. Once there, we parked in the downtown and walked towards the Battlefield. During the early 19th century, the United States Navy established a shipyard at Sackets Harbor in order to make a show of force to the British Naval Yards at Kingston. With the start of the War of 1812, this Naval Base proved invaluable in conducting operations on Lake Ontario and its bordering communities. The Naval Yard produced 11 ships capable of dominating the Lake, and established itself as one of the primary training grounds for sailors and officers in the nation, while the Army used the port as a spring board to invasions of Upper and Lower Canada During the war itself, the population skyrocketed so that it was the most populous place in New York North of the Mohawk River. Of course with its relative importance, Sackets Harbor made itself a ripe target for the Canadians and British. On two occasions, the British attempted to either capture or destroy the Naval facilities. The first was on July 9, 1812 and one of the first engagements of the War. Then, 5 British ships sailed up the harbor in order to burn the scantily defended Yards. The USS Oneida, acting as a floating battery, and other guns nearby emplaced, fended off the British eventually turning them back to Kingston. The second attempt occurred a year later on May 29, 1813. Then, the harbor, much more built up and defended, was attacked by a British landing force. The majority of the American forces were off burning York (present day Toronto) and attacking Fort George, and so the British command viewed the time as being ripe to take Sackets. With no Generals to command the expedition, Lt. Gen. Sir George Prevost, the Governor General of the Canadas and Commander and Chief of all British Forces in North America, organized and led the attack. The British landed some 800 soldiers on an island South of the docks and pushed their way across the causeway onto the mainland. There, they made a slow push against the American defenders who were deeply intrenched. Had Prevost brought the guns of his Navy to bear on the blockhouses and trenches of the Americans, the battle would have likely gone in favor of the British. But Prevost was a timid leader and as soon as the Americans made even the remotest counter attack, he declared the battle a lost cause and retreated. Of course this didn’t prevent the Americans from making their own blunders. At one point, a Navy Lieutenant, believing the Army to be routed, set fire to the stores and dock yards. All in all a fairly representative battle of the War of 1812. Perhaps the largest consequence of the battle was the actions that followed. Feeling that Sackets Harbor was undefended, Admiral Chauncey (commander of Naval forces on the Lake) made a swift return from the Niagara Peninsula. This left the Army, reeling from their defeat at Stoney Creek, threatened, forcing them to retreat back to Fort George and Fort Niagara, ending the second invasion of Canada. Today the battlefield is little more than an open field with a few restored homes. Nowhere near the number of monuments as Antietam or Gettysburg, but I love visiting them all the same. After visiting the battlefield, we needed to get moving. It was approaching 2 o’clock and we still had a ways to drive and some hikes to hike. So we got back on NY 3 and headed into Watertown. I would like to say that we stopped only for gas. But we happened to stop at a gas station…with a Tim Hortons. And behind said gas station…was a Sonic. Naturally we stopped. We drove through downtown Watertown which was fairly scenic with many ornate churches, and then returned to the countryside heading back into the Adirondacks and nabbing our final county for the trip: St. Lawerence. When we got near Wanakena, NY, we pulled to the side of the road for our next stop: Cathedral Rock. 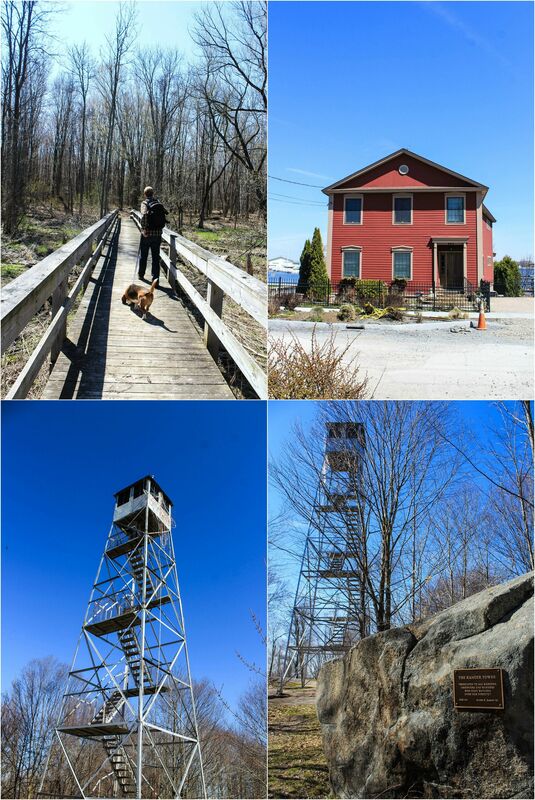 Unlike the Cathedral Rock in Tucson, the Cathedral Rock in New York is the shortest mountain with a fire tower. What’s more is that it sits on land belonging to the State University of New York’s Ranger School. We anticipated an easy two mile round trip hike to the peak. There was no trail map, and in fact, the trails were more forest roads, but I figured I could remember the general layout of the area based on a map I had seen on All Trails. Naturally, I thought wrong, and rather than taking the sane approach of staying on the trail/road, I decided that, since the peak was so short, and it was the only peak around, we could just trail blaze up hill until we reached the top. A stupid idea under normal conditions I would say. It would have been quite easy for us to have gotten insufferably lost or hurt. But what do you know, it worked. We made it to the peak and our 19th firetower in one piece hardly out of breath. Of course, I know better than to test my luck twice, and so we followed the forest road down and back to our car. It was getting late by now, and we had to face the facts. We would have liked to throw one more firetower into the day, but we also wanted a camping spot before dark. Figuring the firetower would still be there tomorrow, but the campsite wouldn’t, we skipped our last hike and headed to find a campsite. We followed NY 3 into Tupper Lake, where we picked up NY 30 south. At the south end of the lake, we followed NY 421 out towards Horseshoe Lake where we quickly found a camping spot and set up for the night. It was much less chilly than the night before and we slept all the better for it.